Here are some points I try to keep in mind when working with undecided individuals. Are you really “undecided” about your career choices or are you “open to opportunities?” If you are not sure what you want to do, the first step is to change your mindset. I truly believe most people are NOT undecided. It does not take me long to determine if a person is more “people focused” or more “math / science / structure” focused and all I need to do is ask them if they’d like to do something that is the OPPOSITE of their personality and they say “eeewww…that’s gross” (as Jimmy Fallon says). Well if you know what you do NOT want to do, then down deep, you must know what you DO want to do. You just need to find the right words to get your head around it and change your thinking. 1. Think skills first, not occupations or job titles. The world we live in today is very different than 20 years ago. Employers are looking for a variety of skill sets to increase their production or productivity. If you focus on your skills and can articulate them to a potential employer, you will clearly have their attention and you might be surprised at the variety of jobs that require those skills. Think about past accomplishments that you are most proud of. What skills were you using when you did it? We naturally gravitate to doing things we are good at and then we do them over again because it feels good. Pay attention to this and trust your hunches (see #3 below). Look for broad skill trends as well as specific skills (i.e. I am very good at explaining things to groups of people in a helping relationship). What classes have you always enjoyed and why? The “why” question is sometimes harder. Have you enjoyed history classes more than science classes? If so, what is it about history you enjoyed the most? The political ramifications? Cultural changes over time? Getting to know individual people throughout history? The skill here might be your ability to analyze broad themes or to analyze / understand people. Think about what classes and why. What jobs did you enjoy the most or what parts of jobs did you enjoy the most? Nothing gets us closer to understanding skills than using skills. I had 2 students once that worked at Dunkin’ Donuts, one hated it and the other loved it, both for very different reasons. What are your reasons? Ask people (like your parents, uncles & aunts, close friends, teachers, etc…) what skills they think you have. We fail to ask these questions and assume that we’ll figure this out somehow by a miracle. I wished I’d asked my dad about my skills when I was in high school. I choose Forestry for a major because I had to pick SOMETHING in my senior year. Turns out a couple years ago he tells me that as a young child I was always talking to adults and was comfortable talking with all kinds of people, even people I did not know. My skill of helping & communicating with people did not come out until years later to me, but Dad saw it years ago. 2. Think about broader industries and types of companies. Don’t get too focused on whether you want to work in “graphic design” or “marketing”. Think about working in the “creative economy”. This will broaden out your options and open you up to many more possibilities that you may not be aware of. (see #5 below). Are there types of companies that appeal to you more than another? Is it non-profits vs for profit? Are there groupings or industries you prefer? Community & Social Services? Healthcare? Media & Communication? Legal? Business & Financial? If so, you can explore these broader themes on websites such as the Occupational Outlook Handbook. (look on the left side of the webpage). Then talk to people who are working in these areas to see what is out there. 3. Trust your instincts. For too long our society has believed that decisions can all be made using logic and / or that a computer can figure this out for me. Sorry about that. Simply not true. I met with a student the other day that had great instincts on what to do. I simply kept saying, “trust those instincts, you are right on track.” And she was. She just needed to confirm them with me. Think about it. When you meet people, why is it that some people you immediately like and others you think are kind of creepy? Instincts. It is what has kept humans alive for years and you need to pay attention to them. Remember the game “hot and cold”? Try this. Go to resources like the Occupational Outlook Handbook (OOH) or O*NET (another Dept. of Labor site) and simply click on jobs you think you’d like and then look immediately at the link SIMILAR OCCUPATIONS (in OOH) and RELATED OCCUPATIONS (in ONET). Is there are theme you can see? When you read about a job think, “Am I getting closer here?” (warmer). And pay attention to that little voice in your head and the gut feeling about jobs because there is an inner voice in all of us. 4. Think of yourself as an independent contractor. What I mean is you must view yourself as a person who brings a set of skills TO an employer. Present yourself as a contractor with a variety of transferable skills that you bring to your employer as ‘adding value’ to their company. Example, “I am an excellent writer, have the ability to analyze complex information, synthesize it, and make it understandable to others using my strong writing skills and presentation skills.” When you embrace this thinking it changes your mindset on what you bring to the table and reinforces the fact that you are skilled and can take your skills to a wide variety of employers, not just your first job. Think of this as not looking for a JOB, but looking for an opportunity to help an organization make money, save money, or look good. 5. Embrace serendipity. I believe that you have to use ‘intentional serendipity’ in your career search. What I mean is that you must be open to discovering something new as you research potential occupations. AND you must be ‘intentional’ about it. You must DO something like using the OOH or ONET, or talk to people working in the field you are interested in (informational interviews), or taking a class because it looks interesting. Be curious, be willing to take some risks like talking to people you don’t know, be open to change, and above all else be willing to change your direction if you ‘discover an occupation by accident’. More blogs on finding work using SKILLS first. If you like this topic of using happenstance and serendipity in the career search, check out this 5 week, discussion-based online seminar for career practitioners. Career Advising Using Happenstance. Very nice article. Yes we talked about this before. Well, I got my dream job after retirement…working at Alfred University’s Career Development Center as a part time career coach. Jim, I really love it. Right now I am working one day a week (volunteer) and primarily with resumes and cover letters. I want to do mock interviews with my video camera, but that is next. If you are going to MACCA in December, I will probably see you there. I will be with Mark McFadden and the AU group. I hope you and your family are doing well and also your business. So good to hear Don and I appreciate your feedback on my “thinking” of working with the undecided student…I mean the “open to opportunities student”. As is frequently the case, PERSPECTIVE is the key to identifying options. Thanks, as always, for your insights…. It is amazing how important attitude and perspective is. When I tell students they are NOT undecided, they actually look relieved. They can stop ‘beating themselves up’ and move on in a positive state of mind. Great article. Your focus on identifying skills as opposed to job titles or majors is really important. I find that many students struggle with identifying their skills, though. So, getting them into situations; volunteering, internships, part-time/seasonal, student club leadership roles and even class projects can provide short-term insight about their abilities in different jobs. Other activities, like your hot and cold activity are also helpful. I find that providing opportunities to interact with professionals in various fields, through informational interviewing, speaker workshops, and networking can also provide approachable role models who can help students identify skills required for various professions and raise their sense of competence for an occupational pathway. I also think assessment tools, such as the MBTI, used in conjunction with group discussions can also help students clarify their skills. For instance when an ability comes very easy to a student, for example creativity, they don’t necessarily recognize that they even have that ability, as it doesn’t seem challenging for them. Realizing that others struggle to be creative, or write well, or attend to details, etc., through the use of assessments, allows a student to grasp their abilities as unique strengths that they can potentially market. Great point about the use of assessments in helping people identify or clarify their skills. So much of what we do is to give people the “words” or “language” to help them see themselves in a different way. Then to take this information and use ‘intentional serendipity’ to discover opportunities. Great article! I always enjoy reading your articles, but don’t take the time often enough to comment. I like your suggestion of using “Intentional Serendipity” in a career search, and then taking action on opportunities that arise. I can’t remember where I heard the term “Deciding Students” first, but like your term, “Open to Opportunities Student” it seems to be a less negative term than “Undecided Students”. 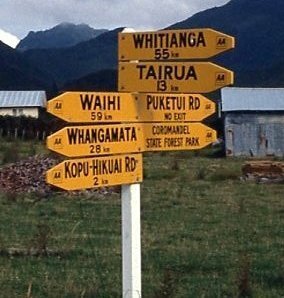 I was intrigued by the photo you included, and I must admit I have never traveled to Whitianga or any of the other towns the signs point to…and had to Google the names to find out the towns can be found in New Zealand. Was that a personal photo from a backpacking trip of yours? Thanks for your comments John. I do like “deciding students” as well but the “open to opportunities” is from Krumboltz’ Happenstance theory.